Colloidal Oatmeal is the best thing that ever happened. Has your grandma ever told you that Oatmeal is good for you? Mixed with Brown Sugar. Are you drooling yet? That sounds delicious! The point is, your grandma is right. 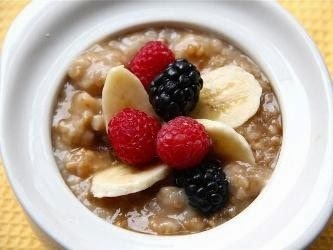 Oatmeal is a power food for the body. It's gluten-free*, has tonnes of fiber and fuels the rest of your day. But one thing you might have not known is the benefits of colloidal oatmeal. *Raw oatmeal is gluten-free. However, those instant store brought oatmeal may be processed in the same area with other grains that may have gluten in them. Colloidal oatmeal might sound complicated, but it's simply oatmeal that has been ground up into fine powder. Through its powder form, it is like a harbinger of great things for the skin. 1. Colossal Curer of Skin Inflammations. Colloidal Oatmeal helps reduce skin inflammations, such as eczema, dermatitis, psoriasis, insect bites, sunburn and even rashes. This is because oats are rich in a type of fiber called beta-glucans (this is also why your bowl of oatmeal gets gooey after adding water). The beta-glucan is absorbed by the skin cells, which in turn, stimulates the immune system to increase chemicals and enzymes to fight off the inflammation. With so much overwhelming evidence of it's effectiveness, the US FDA (Food and Drug Administration) has identified this natural remedy as an effective skin healer. Note: Not many natural remedies have been approved by FDA as being effective. 2. Mighty Protector of Skin Cells. Colloidal oatmeal can moisturize the skin after a bath. The beta-glucans are water soluble, so they help retain the moisture and water in the skin. This in turn, helps moisturize the skin and prevent it from becoming dry. The additional proteins, flavenoids, and healthy fats keep the skin healthy and supple. The added water aids the skin to regenerate itself, thus aiding the skin to unveil its natural color. Colloidal Oatmeal is so remarkable that it is widely used in skin care products. Even those without any skin problems can see added benefits by using colloidal oatmeal. 3. Dignified Cleaner of the Body. Colloidal oatmeal is rich in saponins, a chemical compound that behaves the same way as soap. Saponin molecules on one hand, bind to oil and water in the other, so it really effective at cleansing the skin. It removes dead skin cells, exfoliates the skin and is a wonderful natural alternative for the daily soap regime. With all the amazing benefits summarized above, it's no wonder Samana Naturals carries the Colloidal Oatmeal Lemongrass Soap to help you discover the benefits of oatmeal. This soap is gentle enough for babies to use and has a wonderful lemony fragrance to add some zest to your day. Go ahead, add some oatmeal into your life!